We offer well organized tours and island hopping programs, in carefully chosen locations on the islands and nearby areas, some known only by the locals. While some of our tours are seasonal, most of them are well prepared in such manner that can take place throughout the whole year round. Butterfly Valley is a very popular place on Rhodes from the mid-June until mid-September. During this time thousands of butterflies appear here attracting tourists from all over the world. The Valley of the Butterflies lies approximately 5 kilometers southeast of the village of Theologos. It is a natural park and protected area by Natura 2000. Every year, during August, thousands of “Panaxia Quadripunctaria” butterflies are in the valley in order to reproduce. This species of butterfly is common in the Mediterranean, also found in Crete and other Greek Islands. The combination of the valley’s climate, flora and the magnificent scent of the trees, creates the perfect conditions for the birth of caterpillars. In the beginning of June they transform into strikingly beautiful butterflies. They fly during the cool evenings and they spend the hot summer days resting in the shadow on the trees and plants. They mate by the end of August and in September they fly away from the valley, sometimes for more than 20 km, to lay their eggs among bushes and plants. Once they lay their eggs they die. The Valley of the Butterflies is one of the most attractive and remarkable places to visit on the island, while visitors requested not to disturb the butterflies. We suggest combining the tour to the Butterfly Valley with Filerimos Hill. 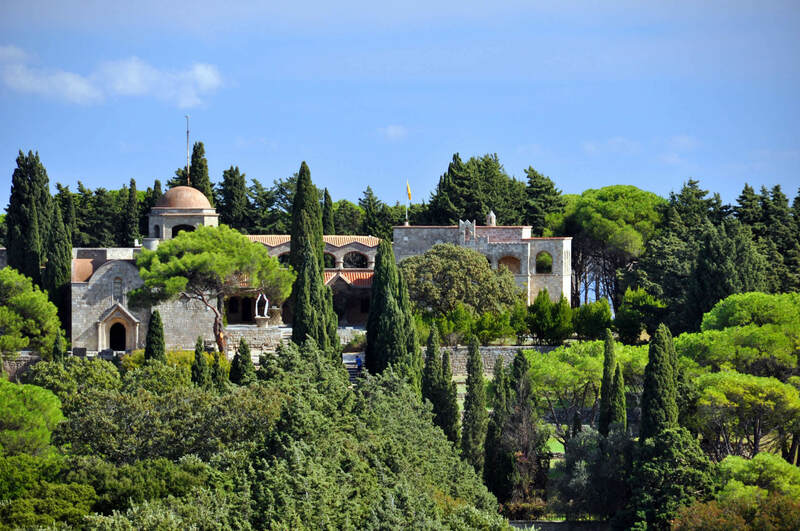 You will enjoy the old Byzantine church, ancient archeological site, amazing views for miles and also have an opportunity to feed the peacocks! . Also on the top of the hill there is a giant cross (about 20metres high, with 66spiral steps) which take you to an observatory to enjoy the fantastic panoramic view for miles in every direction! The lovely tree lined path to the cross symbolizes the story of Jesus Christ.